Building on Danone’s long-term commitment to balancing financial success with social and environmental responsibility, its U.S. subsidiary, formerly known as DanoneWave, commemorates its first anniversary by announcing the achievement of becoming the largest Certified B Corporation® in the world — two years ahead of its declared target — and changing its name to Danone North America. As the maker of beloved food and beverage brands including Dannon®, Danimals®, Silk®, So Delicious®, Horizon Organic®, Vega® and Wallaby®, among others, Danone North America is a top 15 food and beverage company and top organic food manufacturer in the U.S., as well as a leader in plant-based and organic food and beverages. It was formed one year ago as DanoneWave, when the Danone U.S. dairy and WhiteWave businesses were combined, to create the largest Public Benefit Corporation in the world, following Danone’s acquisition of WhiteWave Foods. Incorporating as a Public Benefit Corporation legally committed the new subsidiary to balance shareholders’ financial interests with social and environmental considerations. The company’s new name – Danone North America – represents an intention to continue its purpose journey with a single identity that’s easily recognizable to the many people who enjoy the beloved brands Danone North America makes. Becoming a Certified B Corporation takes the company’s commitment one step further. B Corp™ Certification is for businesses what Organic is to food products: a promise that a company is doing business in a way that meets rigorous standards of verified performance, transparency and accountability and is Certified by B Lab®, a third-party non-profit. Today’s announcement also supports Danone’s long-time dual project of balancing economic success and social progress, which the company’s then CEO, Antoine Riboud, first articulated publicly in 1972. Today, with the addition of not only Danone North America in the U.S. but also Danone Canada, 8 Danone subsidiaries in total have been Certified so far in Argentina, France, Indonesia, Spain and the United Kingdom, including the leading U.S. organic baby food brand Happy Family. Danone aims to be the first multinational food company to obtain a global B Corp Certification and has partnered with B Lab since 2015 to help define a B Corp model suitable for publicly traded global companies. To obtain the B Corp Certification, companies must complete a B Impact Assessment and earn an audited minimum score of 80 out of 200 possible points and recertify—with the aim to continuously improve—every two years. Danone North America achieved a score of 85. In addition to becoming a Certified B Corporation, Danone North America continues to make progress towards its purpose of nourishing people, communities and the world. This includes fighting climate change, driving more sustainable ingredient sourcing, advancing packaging recyclability, reducing waste, conserving water, fighting hunger, supporting local communities and ensuring animal welfare. "A successful B Corp movement needs an inclusive community of companies of all sizes: from Fortune 500 companies to small sole proprietors. Today’s announcement shows how even complex multinational corporations can commit to balancing meaningful change with shareholder expectations. We could not be more excited that Danone North America undertook the significant effort to become the largest Certified B Corporation to date, and we are confident that this news will inspire other companies of similar or larger size and scope to join the movement,” said Bart Houlahan, co-founder of B Lab. For more information about Danone North America, please visit www.danonenorthamerica.com. For more information about B Corp, please visit www.bcorporation.net. To see the B Corp profile for Danone North America, please visit www.bcorporation.net/community/danone-north-america. Danone North America is a Certified B Corporation business unit of Danone and operates in the U.S. from headquarter offices in White Plains, NY and Broomfield, CO. Danone North America was formed as a Public Benefit Corporation in 2017 to nourish people, communities and the world through its diverse portfolio of healthful dairy- and plant-based products, coffee creamers and beverages. 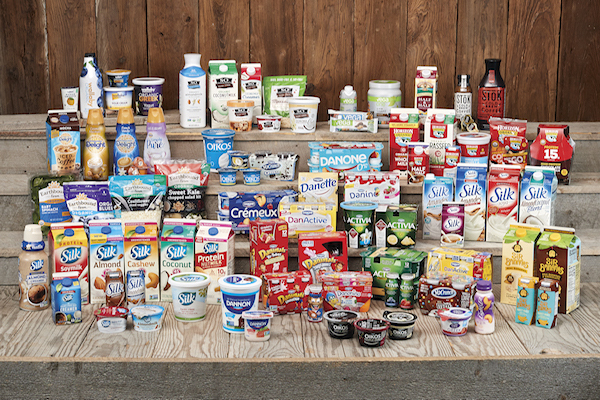 Its portfolio of brands includes: Activia®, DanActive®, Danimals®, Dannon®, Danonino®, Danone®, Earthbound Farm®, Horizon Organic® premium dairy products, International Delight®coffee creamers and iced coffee, Light & Fit®, Oikos® Greek yogurt, Silk®plant-based foods and beverages, So Delicious® Dairy Free, Vega® and Wallaby® Organic. The mission of the Company is to bring health through food to as many people as possible. For more information, please visit DanoneNorthAmerica.com. B Lab is a nonprofit organization that serves a global movement of people using business as a force for good. Its vision is that one day all companies will compete to be best for the world and that society will enjoy a more shared and durable prosperity. B Lab drives this systemic change by: (1) building a global community of Certified B Corporations; (2) promoting Mission Alignment using innovative corporate structures like the benefit corporation to align the interests of business with those of society; (3) helping tens of thousands of businesses, investors and institutions Measure What Matters, by using the B Impact Assessment and B Analytics to manage their impact — and the impact of the businesses with which they work — with as much rigor as their profits; and (4) inspiring millions to join the movement through compelling storytelling.